Skyjet's 94-seater BAe 146-200 takes off from the runway of Basco Airport. A NEW airline is taking wing to serve premium tourist destinations in the country by offering passengers the full service of a legacy carrier at affordable fares. Magnum Air (Skyjet) Airlines is launching its first scheduled service by flying to Basco, Batanes, on December 14, just a month after the Civil Aviation Authority of the Philippines (Caap) granted the carrier its airline operator certificate (AOC). In an exclusive interview, Dr. Joel Mendoza, Skyjet president and CEO, said the airline’s flights to Basco will initially be three times a week—Mondays, Wednesdays and Fridays. The flight will take only 70 minutes on the carrier’s jet plane, a British Aerospace System (BAe) 146-200, which can carry 94 passengers and 3 tons of cargo. Skyjet will also be flying from Manila to Busuanga in Palawan (four times a week), beginning February 15, 2013; to Caticlan, the gateway to Boracay Island, in March 2013; and is considering to fly to Surigao City, Surigao del Norte, a jumpoff point to the country’s surfing capital of Siargao. It is also mulling to fly next year to Virac, Catanduanes, and Catarman, Northern Samar. While not considered premium tourism destinations, Mendoza said these destinations are currently underserved by air services, despite the huge demand for travel there. “We are a boutique airline,” Mendoza explained. Dentist-turned-airline operator Dr. Joel Mendoza. A one-way fare to Basco will cost about P6,000 per person, “but we will be offering promo fares during the lean season,” according to the Skyjet CEO. He said that Batanes residents will also get “special Ivatan fares.” October to June is usually the peak season for travel to Batanes. Skyjet’s fleet consists of two BAe 146-200 jets, the same planes used by the British royal family, British Airways, Lufthansa AG and a number of other European airlines. “We give premium to safety, comfort and convenience,” Mendoza said. He added that the BAe 146-200 is the only plane that has been certified to take off from and land at the Basco airport, which has a steep runway slope of 4.5 degrees, owing to Batanes’s general rolling terrain. Most commercial airplanes are certified to take off from and land at airports with a maximum runway slope of only 2 degrees, or runways which are almost flat. If a plane will have to operate in an airport with a runway slope of more than 2 degrees, the aircraft manufacturer’s engineers need to meticulously test the plane in that runway using its own pilots, before certifying that the plane can safely operate there. 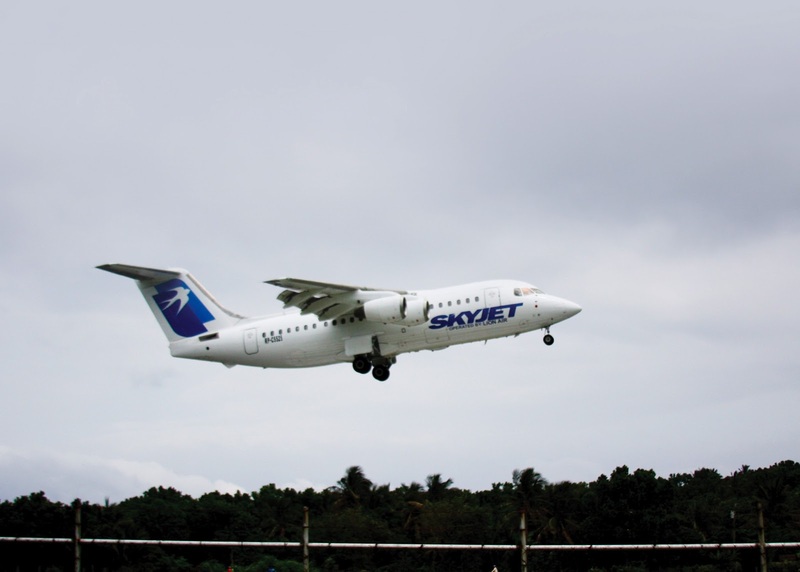 “The BAe 146-200 is specifically made for short landings and takeoffs. It specializes in [operating in] unpaved runways so we can assure passengers of ease in landing even in smaller airports,” Mendoza said. All Skyjet’s pilots are Filipinos who have clocked in 10,000+ of hours specifically on BAe146 Series planes, he added. These veteran pilots flew for City Jet, Lufthansa and other airlines. “This increases the safety and reliability of Skyjet’s flight operations,” Mendoza said. According to Skyjet’s certificate of public convenience and necessity granted by the Civil Aeronautics Board, the carrier is allowed to operate charter services for domestic and international routes, regular scheduled service for domestic destinations and cargo services. A dentist by profession, Mendoza is also a director of the Batanes Cultural Travel Agency, which has been selling travel packages to Batanes since 2007. “I just want to promote Batanes as a cultural tourism destination that will help create more jobs for the Ivatans. Having a direct air transport service to Batanes will also allow the locals to visit Manila,” he said. Capitalized at P50 million, Skyjet has been registered with the Securities and Exchange Commission since September 2005. Its chairman is Telesforo Castillejos, former governor of Batanes, while its director of flight operations is Capt. Antonio Buendia, a veteran commercial pilot and former president of Philippine Aerospace Development Corp.